Scabious columbaria is an attractive native perennial of dry unimproved grasslands and unshaded rocky outcrops, generally on calcareous substrates. 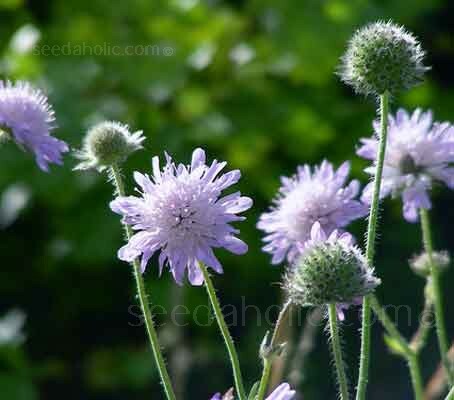 Scabiosa columbaria produces a mass of lilac-blue flowers, in round heads on long stalks. The flower stalks arise from a rosette of blunt oval and long-stalked leaves. This native has been the original plant material from which many award winning garden cultivars have been bred and looks equally at home in a garden border or wildflower meadow. This perennial form of Scabiosa are very easy to grow, they are hardy to below -18°C (0°F) and will flower in their first year from an early sowing. Scabiosa is a good source of nectar for both bees and butterflies and never fails to bloom throughout the whole summer and last well into autumn. These beautiful flowers may have a rather ugly name, but they are one of the best perennial flowers for cutting, with long, clean stems that display beautifully in a vase. The combinations for Scabiosa with other plants are limitless, for it can be used with spring annuals, summer perennials or in a bed as groundcover and colour filler. 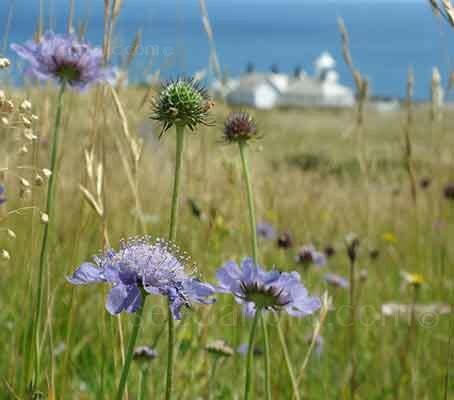 Mass plant Scabiosa in a wildflower garden or position smaller clumps on a rockery. Use it to provide a splash of colour in a townhouse garden or as an edging plant along the front of an informal border. This reliable plant gives a sea of beautiful blue flowers week after week. Seeds can be sown indoors or directly where they are to flower. Sow January to March for flowering from June onwards, or April to August for flowering the following year. Sow thinly, 6mm (¼in) deep in drills 30cm (12in) apart, directly where they are to grow, in well-cultivated soil which has been raked to a fine tilth. Water ground regularly, especially in dry periods. When large enough to handle, thin out seedlings until they are finally 30cm (12in) apart in spring. Fill trays or pots with good, well draining seed compost (John Innes or similar). Stand the pots in water to moisten then drain. Sow 1/16 inch (1.5mm) deep. Cover seed lightly with a fine sprinkling of sieved soil. Place the container in a propagator or seal in a polythene bag after sowing to keep the moisture constant. Place in a warm place at around 18 to 21°C (65-70°F). Make sure that the compost is kept moist but not wet. Germinates usually in around 2 to 3 weeks but can occasionally be erratic. Prick out seedlings when large enough to handle into 9-10cm (4in) pots after 4 weeks. Grow on at 10°C (50°F) Use larger pots, 13-15cm per plant, if they are to stay in containers. Acclimatise young plants to outdoor conditions before planting out. Space the plants 30 to 60cm (12 to 24in) apart. 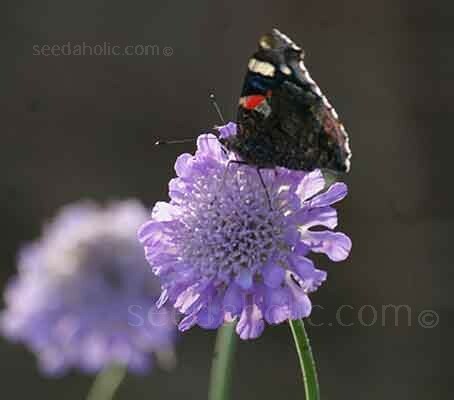 All scabious prefer well-drained soil and a sunny position. They dislike cold, wet winters. A top dressing of grit in October will aid surface drainage. However they also hate hot, humid weather and do best in temperate conditions. S. columbaria has long stems that initially produce one large flower. But if you snip the dying flower stem back to the lowest buds, halfway down, two slightly shorter-stemmed flowers will spring from the bud axils. Deadheading encourages plants to flower on and on. Many scabious (and related genera) set seed prolifically if left. Seeds can be collected in autumn, dried and sown the following spring without losing viability. Young plants flower most freely and after a few years the plant can look worn. Revive by dividing and replanting in spring or autumn. Cut flower stems can be harvested, when the flower show colour. Put the stems in warm water immediately. Vase life: 8 to 10 days. Cold storage is not recommended. Avoid the formation of seedpods in order to encourage the following flowering. Over the year harvest 20 stems per plant. Cottage/Informal Garden, Flower Arranging, Flowers Borders and Beds. Butterflies and Bees. Wildflower gardens and meadows. Scabiosa columbaria is native to the Mediterranean region of Europe, Western Asia and North Africa. It is most abundant in the Mediterranean region where there are 11 genera and 290 species. 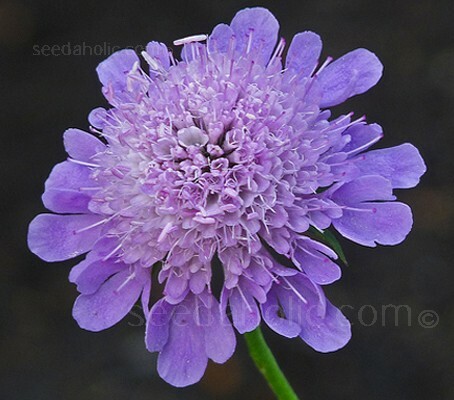 The first scabious ever introduced was the small-flowered S. atropurpurea in 1591. Some species of Scabiosa, notably this small scabious (S. columbaria) and Mediterranean sweet scabious (S. atropurpurea) have been developed into award winning cultivars for gardeners. Scabiosa is a genus in the family Dipsacaceae, or teasel family. Many of the species have common names that include the word scabious; however some plants commonly known as scabious are currently classified in related genera such as Cephalaria, Knautia and Succisa. This pretty wildflower could be confused with Field scabious or Devil’s-bit scabious, both also members of the teasel family. 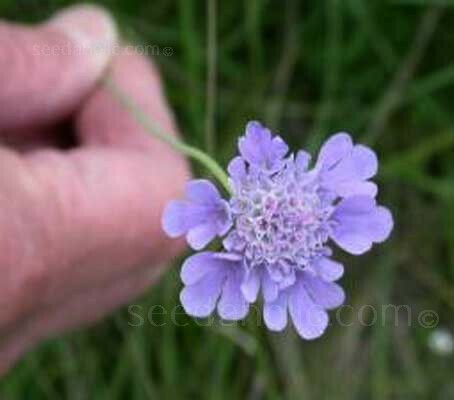 Small scabious as the name suggests is smaller, slimmer and less hairy and the flowers have five not four petal lobes. The genus name ‘Scabiosa’ derives from the word scabies, which comes from the Latin word scabere meaning “to scratch". In medieval times species of scabious the plants were believed to relieve the itch of scabies and other afflictions of the skin including sores caused by the Bubonic Plague. In the 17 century Nicholas Culpepper prescribed its root as an ointment for the cure of wounds, swollen throats, snake-bite and the plague. The species name 'columbaria' means “dove-like” from where it gets the common name Dove Scabious. The common name of 'Pincushion flower’ derives from the fact that its long, needle-like pistils resemble pins sticking into a pincushion. Alternative common names are Dove pincushion, Pigeon scabious and Small scabious. Late winter/late spring and late summer/autumn. Germinates usually in around 2 to 3 weeks but can occasionally be erratic.